Sean Conway is an adventurer. He used to be a photographer in London. He has cycled around the world and done the longest triathlon around Britain amongst many more big adventures. 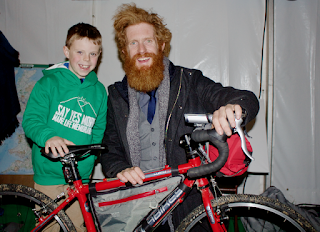 I was lucky enough to meet Sean at Yestival so that’s why I have read his book. 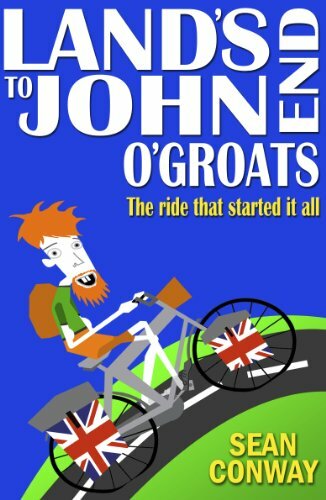 He has written many books but I have just read his first, ”Land’s End to John o’Groats - the ride that started it all”. It was great. Sean used to fly to hot beaches in other countries for his holidays. He was then forced to go to places closer to home because he remembered that he wasn’t related to Richard Branson and didn’t have enough money. He was looking for something adventurous, fun and challenging. He looked at doing an adventure somewhere far away, dangerous and big but it’s expensive to do those kinds of adventures, so and he looked if he could do one in the UK. He made a list of all the places he had been to in the UK and most of them he hadn’t been to.Sean decided that he would do something in Britain, so he decided to try cycling from Land’s End to John o’Groats. For his trip he raised money for charity to save hedgehogs that were ill.
Sean started his epic voyage in 2008, he had given himself 4 weeks to do around 1300 miles. I liked his idea of adding on extra adventures to make an even bigger adventure, like when he climbed Ben Nevis and added the Orkney Isles on to the trip. Sean’s journey took him through Cornwall and Devon, which was tough, going down small country lanes and sleeping in a hostel in Exeter where lots of people snored and talked in the night. The Lake District he battled hills in, the Lake District, where he is living in his dream home for the winter this year. On the way, he received kind offers of food, money (a guy in a pub even gave him £84 for charity) and free things; Sean also stayed with family and friends. Sean took his mascot ‘little flying cow’ for company. He was quite funny. He called Sean an idiot and Sean said “Shut up or I will leave you in that ditch”! At other times Sean just liked the sound of nothing. On my #CycloClimbGB adventure I will be cycling some of the route that Sean cycled, like around Windermere, the road to Fort William and climbing Ben Nevis. I think that this book is suitable for adventurers that are just getting started and need to come up with an idea, or other children that want to find adventure by reading about it so that they are ready to have their own ideas for the future. I have now started Sean’s other book "World cycling stripped bare", because I loved the first book and I want to cycle around the world one day, too. "Land’s End to John O’Groats - the ride that started it all" by Sean Conway is published by Mortimer Lion Publishing.